Aquatic is adding eight new modern-style, drop-in tubs to its best-selling Serenity series, renowned for offering the ultimate in personalized hydrotherapy. 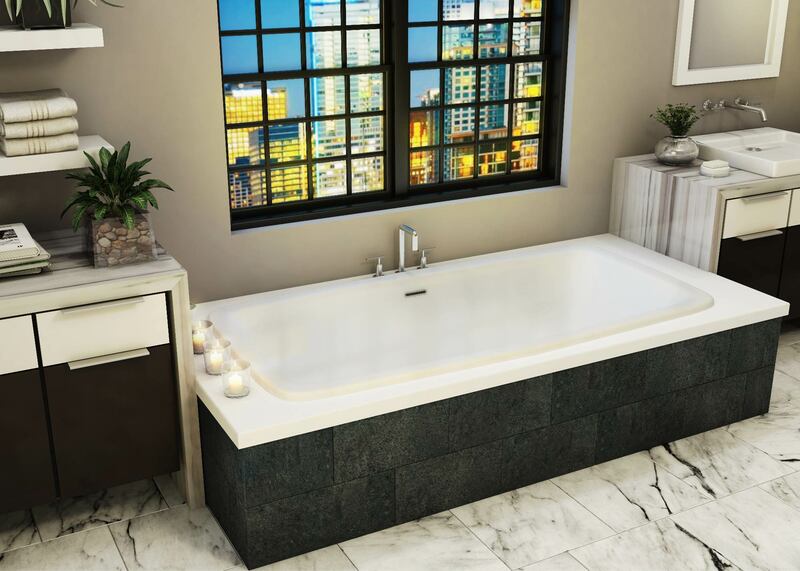 With the Serenity expansion, customers can choose from 55 freestanding, undermount and drop-in, acrylic shells in a variety of sizes, finishes and colors, and also customizable as soaker, HotSoak, air bath or DriftBath(TM) tubs. Sit back in Serenity 55 like you would in a reclining chair, thanks to the tub's front-to-back, graduated deck height, elongated backrest and shaped armrests. Nothing is more important to Aquatic than responding to what we hear from end-users and distributors – once again, they have been the inspiration for us to develop these great new products and expand the Serenity series. Aquatic, the leader in innovative and inspired bathware, today announced the addition of eight new modern-style, drop-in tubs to its best-selling Serenity series, renowned for offering the ultimate in personalized hydrotherapy. With the Serenity expansion, customers now will have a choice of 55 freestanding, undermount and drop-in, acrylic shells in a variety of sizes, finishes and colors, and also customizable as soaker, HotSoak, air bath or DriftBath(TM) tubs. Exclusively available from Aquatic, DriftBath simulates the relaxing experience of sitting in a gentle stream. Aquatic developed the new models based on consumer focus group research and customer feedback on prototypes showcased earlier this year at the International Builders Show in Las Vegas. The new tubs are modern-looking with sleek, clean lines yet soothing and welcoming at the same time, thanks to softening design elements. These include oval bottoms, curved back areas and arm rests that invite the bather to sit back and fully relax. For added convenience and comfort, Aquatic offers an optional linear overflow drain on the new units as an alternative to the traditional circular drain. The linear drain allows the tubs to be a few inches lower in height without sacrificing bathing well and water depth. The baths are available in a selection of sizes with footprints that fit standard bath alcoves. They come in standard and premium colors for the Serenity series. ● Serenity 50 (60”x32”x22”) and Serenity 51 (72”x32”x22”), sized for narrower bathroom spaces yet still big on comfort with a contoured backrest. ● Serenity 52 (60"x36"x22"), Serenity 53 (66"x36"x22") and Serenity 54 (72"X36"x22"), featuring an oval bottom with a rectangular shape at the top to create a spacious bathing well and ample contouring for the bather’s lumbar area. The larger Serenity 54 is designed for two people. ● Serenity 55 (63"x34"x22") and Serenity 56 (69"x38"x22"), which are notable for great ergonomics. Sitting in these oval shaped tubs is like reclining in a chair. The front-to-back graduated deck height and an elongated backrest maximize the bathing space without increasing the tub’s footprint. Shaped armrests help the bather soak effortlessly. ● Serenity 57 (60”x32”x19 5⁄8”), designed with ease of use in mind. The tub’s lower height and optional linear overflow makes entry and exit safer and easier while still providing a deep bathing well for an all-encompassing soak. 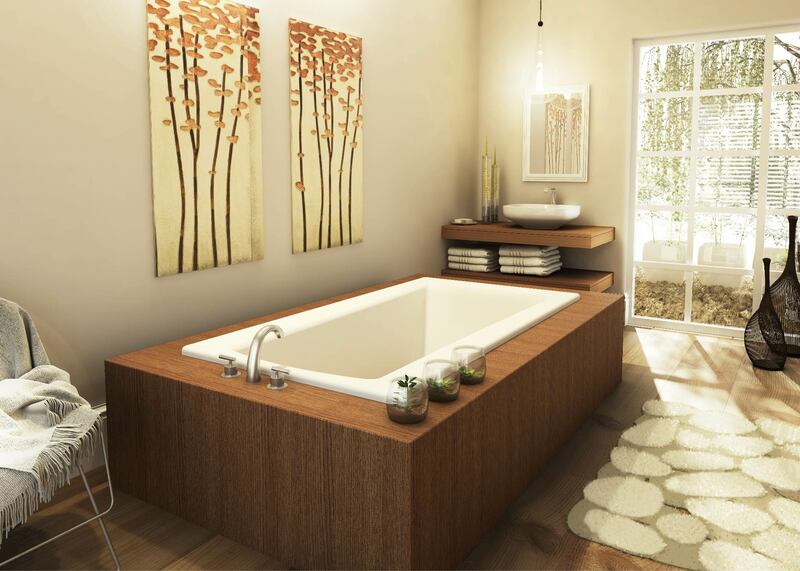 With a rectangular shape and clean lines, this bath beautifies traditional to modern bathroom spaces. Aquatic is introducing the new Serenity models nationwide on a staggered basis. Serenity 50 and 51 are currently available and the rest will be introduced between now and early 2015. Aquatic offers the largest and most innovative selection of tubs, showers and bathware accessories. The company’s world-leading Hydrotherapy, Everyday and Accessible lines include more than 300 products for virtually every need – all inspired and made in America. Based in Anaheim, California, Aquatic serves distributors, builders, plumbing professionals, architects, designers and consumers through a nationwide network of state-of-the-art facilities for manufacturing, distribution and support. For more information, visit http://www.aquaticbath.com. Serenity 54's spacious bathing well easily accommodates two bathers. Designed for narrower bathroom spaces, Serenity 50 delivers on good looks with modern styling and comfort with a contoured backrest.